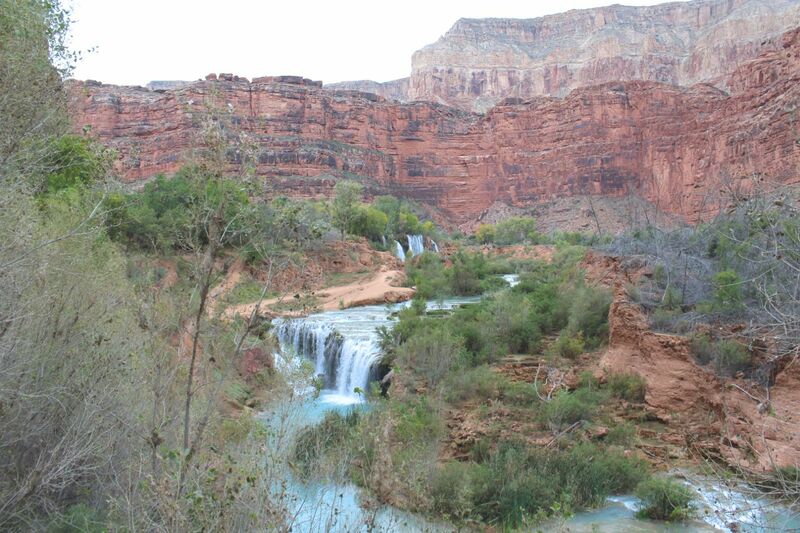 Remember last year, when Curtis and I went on a 3 day 44 mile hiking trip to Supai? [read those exciting posts here: day 1 / day 2 / day 3 ] Several times in those posts, I called this a once in a lifetime adventure. As it turns out, I was wrong…we just returned from this year’s trip! This year was completely different than last. We hiked with a bigger group – 3 other fun couples. There was an ulterior motive for this trip. We knew all that was coming, and how to prepare. The weather forecast wasn’t as desirable as last year, even though it was earlier in the year. And Curtis and my goal wasn’t to hike farther or faster or to relive the whole trip, but rather to try to take in the beauty in a new way, to rest, relax, and enjoy the waterfalls, and each other. By not pushing ourselves to the limit, we were able to return renewed, rejuvenated, and with a different perspective than before. The trip was planned with an itinerary that matched last year’s, with us driving up to Seligman, AZ the night before to minimize the trip the morning of the hike. This worked out well for us both years – we recommend staying at the Deluxe Inn Motel right off of the main road. It’s nothing fancy, but it gives us just what we need – a good night’s rest before a long trip at a great price. Each room is uniquely decorated in a different theme – our personal favorite is the Elvis theme, complete with a large cardboard cutout of the man himself. Curtis and I also really enjoyed conversing with the owner. He happens to own the Supai Inn in Seligman as well, and he genuinely loves operating these hotels because of the people he meets every night. The next morning, we arose bright and early to drive the remaining hour and a half to the trailhead at the Haulapai Hilltop. The best part about this drive is always the Burma Shave signs along the road. Can I start a new campaign? #BringBackBurmaShaveSigns! We only saw one elk along the road on the way up, but on the way back we spotted a group of pronghorns. As we came closer, the anticipation of getting that first peak at the Grand Canyon grew greater and greater until we finally saw a glimpse of the great divide. We reached the trailhead around 8 AM, where we met up with the group and got together our packs with whatever we needed for the next 2 days. After a few trailhead pictures, we were off on our great adventure! Curtis and I tend to walk quickly when we hike. I used to think it was just me trying to catch up with his long strides, but when I was in the lead, he commented that I was going pretty fast. We decided to go ahead of the group a ways to enjoy walking alone together. It’s not often that we get to be alone together, without friends or Charlotte. When we would stop for water breaks, there were times when it was absolutely silent, and we just stood there and listened to that peaceful, calming sound of nothing. Just a light, crisp breeze against my face as I stood there, admiring the sun starting to hit the tall, red canyon walls. It was glorious.We would look at each other and just smile, and know instantly how much the other was enjoying this. This is just what our introverted souls needed to feel refreshed and ready for this hiking trip. When we came to the first river crossing over the bridge, just a mile from the village of Supai, we played Pooh Sticks while we waited for our friends to catch up. I won every time. Curtis can deny it all he wants, but it’s a fact that when you’re faster at dropping the stick, your stick will always win. 😉 Once we were reunited with our group, we finished the hike to the village within the red canyon walls. Upon reaching the lodge, we found that they were on their lunch break and wouldn’t reopen for another hour and a half. Or maybe you’re just not allowed to check in until 1. Anyway, we took our time and had some lunch while we waited. We all enjoyed exchanging our own homemade dehydrated snacks and getting ideas for next time. Vanessa made some amazing tofu turkey jerky, and Jaclyn had mastered something we thought was impossible – dehydrated cantaloupe. YUM! As always, Curtis came prepared with a wide variety of different dehydrated foods, either for snacking on or with the possibility of being reconstituted with water for dinner. Once the lodge reopened, we checked in and dropped off some things in our rooms. Staying in the lodge is rather expensive (as you can imagine…when you’re the only hotel in the bottom of the canyon, you can charge whatever you want!) but on this trip, it proved to be worth it. I think I would have died if we had camped this time, when the lows dropped below freezing and it drizzled periodically! Maybe if we do it again during a different time of year, we’d try camping. For this trip, we were happy to have comfy beds, warm showers, protection from the cold, and lighter packs due to not carrying down camping supplies! Finally, we were ready to hike to the falls. Now remember what I said about some having “ulterior motives” for coming down here? One of our friends had been planning a proposal at the base of Mooney Falls, and today was finally the day! Jessica – I just love reading all of your posts, but especially the ones about Arizona, even though they make me a little homesick. I’m a 3rd generation Arizonan who has now been away living in the Midwest for the last 8 years. 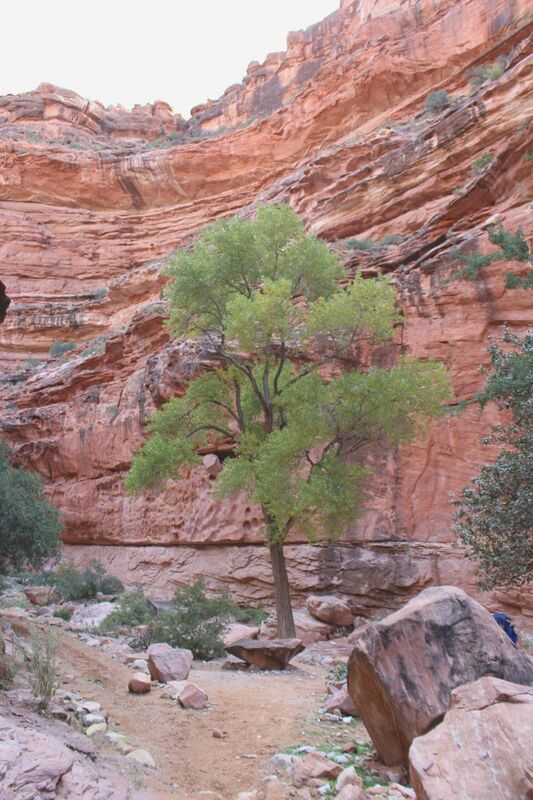 We have hiked so many of the places you talk about, including hiking Supai 2 times (all bc – before children!). 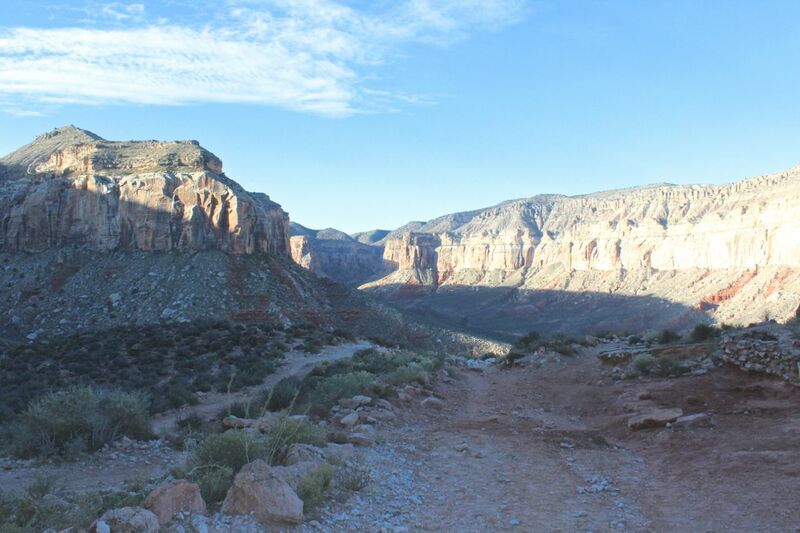 My husband Toby, has also hiked a few times to the Grand Canyon & has always wanted to do the rim to rim hike. Have you been up to the White Mountains yet? My family had a cabin at Hawley Lake when I was a kid & we did lots of fishing around Big Lake – beautiful area. My cousin is also the State Historian – Marshall Trimble. He has an office at Scottsdale Community College and can fill you in on a lot of history in the areas that you’ve hiked. I’ll send you a link to his facebook page. Please keep posting – you have a gift of words. Thank you for the comment! We love it down here too and are going to miss it so much! Where did you guys live when you were here? We have only driven through the White Mountains a few times but wish we could have done a little more hiking there. It’s sad to see all the damage there from the fires in 2011. Thanks for the link! Curtis loves doing lots of research on the area, he’s specifically really interested in the events related to the Civil War in AZ. I was born in Phoenix, but grew up in Tempe (yes we are ASU greaduates!). After we were married we lived in Gilbert, Peoria & Desert Hills. Toby was actually born in Mexico but moved to the US when he was 5. He grew up in Wenden, AZ – so he spent lots of time hiking in the deserts of Western Arizona. My mom grew up in Wickenburg & competed in rodeo’s as a barrel racer. She then went to ASU (was ASC at the time) and got her teaching degree. She taught elementary school in the Kyrene School District in Chandler – she started in the district when they only has one school. My dad grew up on a dairy farm which was located south of Tempe – that area is now Chandler, AZ. We have not been back to the White Mountains since we moved to Iowa – that makes me sad to think of all the damage done by the fires. Interesting “It’s a Small World thing” – Toby & I didn’t meet until college. When he first met Marshall they talked for almost 4 hours – come to find out, Marshall’s college roommate was Toby’s high school teacher and coach. Marshall has written quite a few books on AZ history and is a wealth of information. AND he loves discussing history!